Loic came back to the mountains from his trip to Italy. We’d just managed without him, keeping the house warm and the firewood stocked and the daily hot water rationed just so. I felt like a frontier woman, but we managed through it without major incident. The day he was supposed to be coming back, the anticipation, you know, the kind that you have when your lover is on his way, set in. By mid-afternoon, we were just dying to see him. Ennui hit us both. I made the mistake of telling the baby that when he woke up from his afternoon nap, he’d see his papa again. It was a trick to ply him and I didn’t think he would remember. When he woke up, he still had over an hour to wait. As we all know, to a baby, an hour is an eternity. He loves his papa so. It had been snowing pretty heavily and I did not realize how much had fallen. Night fell. He was late. We can get a phone signal if we stand at one window. Indeed he had left a message, precisely four minutes before. “Lucy, I am stuck in the snow down by the Martinet house. I’ll be there when I can.” My first question was “which Martinet?” There are four families called Martinet in the village, and at first they claimed that they weren’t the least related. Then we found out that one young fellow is indeed somehow related to the woodsman who supplies us our firewood. Then we found out that he is also a some kind of cousin to one M. Martinet up in the neighboring hamlet who is trying to sell a barn near our house. We still haven’t figured out their ways in naming relations. I deduced that where he might be stuck in the snow and bundled up the baby, put on a hat and gloves, grabbed the flashlight, and went out into a blizzard, headed in that direction. Imagine one of those films where a blizzard hits and the trail from the house to the barn is kept by pulling oneself through snowdrifts, along a knotted rope. Then know it wasn’t that bad. There was no way we could get lost. In fact, it was quite charming. I knew the car would be warm and that the baby would find this little journey a better distraction than anything else. The wind wasn’t blowing at all. The snow was crisp, powdery and deep, reminding me of my winters as a child. My boots were crunching delightfully into every step, snow falling in a lacy shroud around us, illuminated by the flashlight. The baby’s hat was covered with a thick layer of snow by the time we saw the headlights shining in the forest. Loic had just succeeded in getting the chains on the front tires of the car. There we enjoyed the perfect climax to our little journey: Running through the snow filled forest (remembered in slow motion), calling out, Loic opening his arms wide and swinging the baby in a big circle through the snow which swirled around them both. The baby was enchanted. It was the biggest adventure he’s ever had. He saw how things looked down in the valley, and my husband being the smart one he is stopped off and picked up some of the kind of provisions we like to keep when we’re snowed in. Raclette, Savoyard ham, bacon, a slab of Tomme, a big loaf of that delicious local bread, plus lettuce, endives and frozen green beans to keep us virtuous. I put on the potatoes while Loic got reacquainted with his baby boy, and we enjoyed a lovely raclette supper just the two of us that evening. The next morning, we woke up full of the anticipation that comes when you’ve just been granted the gift of two feet of fresh white snow, a wood stove, and the man you love after a week apart. There were two potatoes left, and we had nothing to do but stoke the fire up hot. I decided to prepare potato matafans. I have been collecting recipes for matafans for some time now, because they’re emblematic of le Pays de Savoie, my respite from the city. There are a whole lot of recipes, because everyone does them differently. 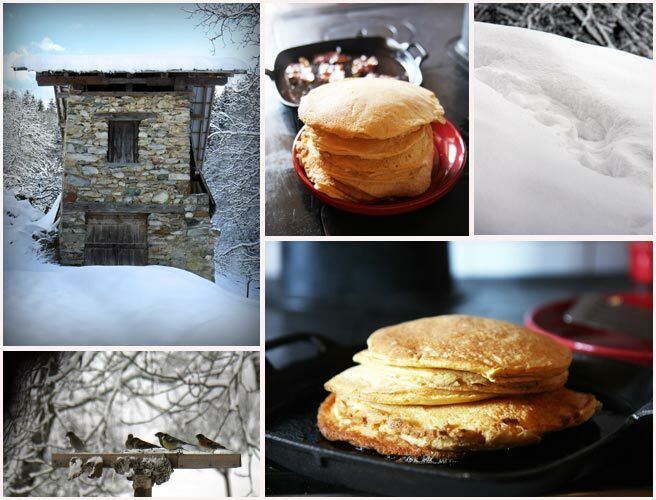 Families all through this stretch of the French Alps do their own variations on the pancake but different, some serving them with toppings to be eaten with knife and fork, some slapping local cheese between two of them to make a delicious fluffy warm sandwich to eat with your hands. These are great prepared in advance of a good uphill hike and taken out of the sack to serve as a fortifying lunch. Indeed, for what’s in them, you can estimate that a couple of matafans will be the equivalent of a small 2 egg breakfast with hash browns and bacon, so plan some extra activity to burn them off. Savoyard is its own language, and in Savoyard, the word Matafan means to calm hunger. A directly translated French name for these cakes are matefaims, and you’ll see the two names interchanged throughout the Savoie region. Traditionally, they were consumed hot in the morning by mountain peasants before embarking on their daily work. Before I ever prepared these in my own Savoyard kitchen, I imagined that they would be heavy things that would sit like rocks in our stomachs. Indeed historically they were made purely with potatoes. They certainly are caloric, but the best thing about them is that the best ones are so light and fluffy they don’t slow us down a bit. A little like savory genoise if you can imagine such a thing, and a little like soufflé, but they don’t deflate and they don’t lose their fluffiness. They are better than pancakes by far. This particular recipe comes from Madeleine Kamman, in her treatise on the Savoie, which is so chock full of historical and ethnographic detail in addition to her childhood memories of summers here that I never get tired of reading it. I use bacon fat when I have it instead of butter, but for the most part it is true to her ratio and method. Mme Kamman’s recipe calls for a half-cup of leftover mashed potatoes but since I usually don’t prepare mashed potatoes up here in the mountains, I just start with the plain boiled potato. I usually throw a sprig of rosemary into the pressure cooker when steaming potatoes for raclette, so this is also the treatment my potatoes have for my matafans. I think it adds a little something. About the warm water: Mme Kamman says that the use of warm water is a Savoyard grandmother’s trick to make the matafans fluffier. I take her word for it since these do come out luxuriously fluffy. There’s never been any need for me to even test how this comes out with cold water. Put your flour in a rather large mixing bowl and peel the skins off of the potatoes. Mash the potatoes roughly with a fork, turn them into the bowl with the flour, and work the chunks of potatoes into the flour with your fingers. Don’t worry if you leave a few potato lumps here and there. Dissolve the salt into the warm water. Add the salted water, the 6 egg yolks, and the bacon fat to the flour potato mixture. Mix it well into a batter with a spoon or a whisk. Beat the 6 egg whites until stiff peaks form. Fold the egg whites into the initial batter, lightly turning it together just until incorporated, don’t stir too much or the egg whites will deflate and you will defeat the purpose of having whipped them. Put a cast iron crepe pan or griddle onto a hot stove and melt a couple of teaspoons of butter on it. Cook the matafans on the stovetop as you would a pancake, flipping them over with a spatula once the underside turns brown. Transfer them onto a plate which you keep in the cool corner of the oven (oh I’d say about 300F or 180C) and one by one, add to the stack, sort of baking them along the way. This treatment makes the edges take on a delightful crisp texture. I serve my matafans with an array of savory things to tuck into them, folded over, for brunch on mountain Sundays we plan to go out walking. Today it was bacon and some of the dent du chat Swiss gruyere, cut in wedges. You can do what you like, they’d even be good with jelly or maple syrup if that floats your boat. What a charming, homey story to read with First Cup, on a day that we're expecting plain old SNOW---the kind which snarls traffic and freezes fingers as they clean windshields and shovel driveways. You included everything---the warmth of home and of homecoming, the provender brought in for sumptuous meals in your snowy seclusion, your isolation with your little one and your time together, the anticipation of the completion-of-the-family return, and the snow-trek adventure which culminated in a welcoming joy of snow-whirls and hugs---a picture which travels across the world and brightens the day here, so far away. Thank you for sharing this most personal, most heart-warming tale, simple in its beauty and warmth. PS Lucy, I could not resist linking this into Lawn Tea today---it's too lovely a story not to share. Another really lovely post. Racheld said it so well. I'll be sharing this one, too. Thanks you two. I appreciate your coming to visit. What size and type of potato? Or an approximation of the mashed quantity in cups. I just returned from Yosemite Valley snow...it was lovely too. Hey Mac, you can use 1/2 cup of mashed potatoes or two small to medium potatoes, whatever you have on hand. Just lovely. Idyllic. Romantic. All that and potatoes too! I loved reading your story! I have Madeleine's book also and love her. We're getting a pile of snow tomorrow and the next day. I just may try your recipe for our table while we watch the snowfall! Such a lovely story, again. I will be back for more. I saw this and thought of you and your much earlier post "On size and scale". And thank you for an always inspiring blog! Sweet of you to think of me. Thank you. What a lovely story..I think it could be a best seller and movie as well..just lovely. I just came across your blog this week. It's wonderful! I enjoyed this post and look forward to reading the new ones too. I live in the midwest and am a stay-at-home mom to three kids ages eight, six and four. I love that for a brief couple of minutes I'm transported to France. Thank you! Lovely story! I have to ask, what is "dent du chat" Gruyère?? I mean, I can translate the words, but have never heard this phrase in relation to cheese- does it just refer to a sharp cheese? It has been too long since I've stopped by to see what you're up to. What a dreamy return to the world of Lucy. Thank you so much for sharing! ...frozen green beans to keep us virtuous. Oh, and of course I want to try those matafans. I'm so intrigued. beautiful post. words that back up a lovely picture. gotta learn more about these matafans. never heard of them. thank you so much for teaching me something new! Just wondering how many this makes, approximately? Hi Adam, this should make 8 big ones, you can count 2 per person, so the recipe would serve 4. Noelle, Dent du Chat is a producer of Gruyere near our house in the Alps - they have an AOC for Gruyere de Savoie. It is a really special cheese. It looks awesome, must be delicious.Want to prepare it.. While we are staying near the Alps too, I will try this lovely receipe tomorrow before my 4 hyngry kids leaves for the ski slopes, but no lovely gruyere at hand so I'll try with the local cheese, The fruity Beaufort d'été! Thanks again for sharing your discoveries. Hi Lucy, Elissa (Poor Man's Feast) just posted your blog on Facebook hence how I came across it. So lovely and evocative of place and home–2 things so important to me as well, and in my writing along with food. Your venture in the snow reminded me of the hard winter rains of Big Sur, CA–well, different yes–but the sentiments the same, waiting for your loved ones to come home, stoking up the fires, the babies all wrapped snug for the out doors, and the long mornings lingering over the stove to cook something nourishing and tasty. Love that list of ingredients your husband brought home-makes me swoon. Thanks everyone, your comments mean a whole lot to me.